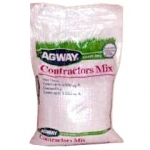 Agway Contractors mixture is a mixture of perennial ryegrass, creeping red fescue and annual ryegrass. Agway Landscaper Mix is a mixture of Kentucky bluegrass, perennial ryegrass and creeping red fescue. Agway Professional Green is an exclusive AGWAY blend of premium, disease-resistant Kentucky Bluegrass for the ultimate in beautiful lawns.